The Maaaaa of Pricilla: A New Year! I can't believe it's a new year on the Farm. The publicist is not feeling well so I am just going to show you my very first post. Greetings all. I am Pricilla; the spokesgoat for Happy Goats Soap. I have decided it was time for me to maaaaa and let everyone know what life is like for a goat. I mean we are a neglected species. 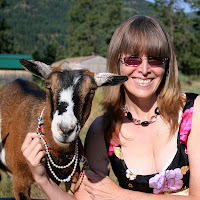 How many goat bloggers are there really? So with the help of my publicist/udder massage specialist I will be spreading the word about life on the Happy Goats farm and with the other goats here; Abigail, Michael and Luke. I won't have much to say tonight as it is late and I am tired, being pregnant and all but I did want to get started and introduce myself. The photo shows me with my publicist/udder massage specialist, Patty. She takes really good care of me and brings me lots of treats. I love apples and carrots by the way..... I am a little embarrassed by the photo. Patty made me wear a necklace for some crazy photo contest she was entering so please excuse her. Hopefully I will have more computer time tomorrow.